Fooducate is a free iPhone app that seems like it could be regularly useful. Using the Fooducate app and your iPhone camera, you are able to scan product barcodes to display both good and bad product highlights. 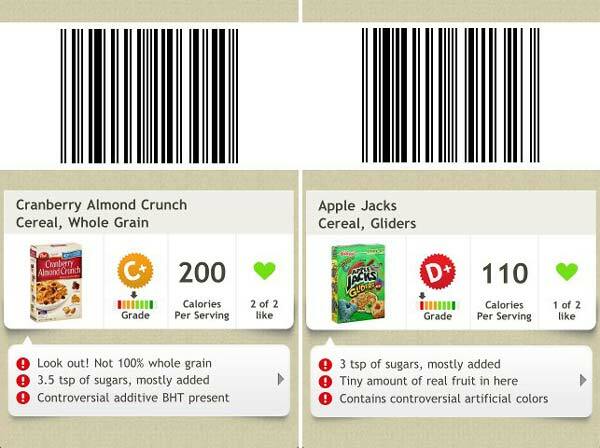 You can compare products and select which products are healthier for you. For instance, you could choose to avoid products with excessive sugar, trans fats, additives and preservatives, and high fructose corn syrup. The app works on iPhone 4, 3GS, and with manual entry on iPhone 3, iPod and iPad. Presumably, it will soon work on iPad 2 as well. Fooducate seems to only be available in the US at this stage, which is not surprising, as it must be quite a task to have up–to–date data on a decent number of products available in stores as it is. Fooducate states that it has data for over 200,000 unique products, and that number is growing constantly. In addition, Fooducate stresses that it is “not affiliated with any food manufacturers, supplement companies, diets, or any sort of magic pill”, so the analysis of each product should be pretty objective. In the iTunes App Store, Fooducate currently has a 4 star customer rating for the current version, and 4.5 star customer rating for all versions on iTunes. If you decide to download (iTunes link) and try the app yourself, please do come back and let us know what you think of it, by leaving a comment. If you have tried it already, what do you think of it?